It is known that one of the major reasons why young people from deprived backgrounds do not become involved in sport is the high costs of equipment and also the running costs of playing. At Centre Spot, we aim to reduce one of the costs to parents and young people. Shoot 4 Boots is a project run by Centre Spot. Our aim is to collect football boots that are no longer required, and redistribute them to disadvantaged young people through our Shoot for Boots football coaching days. Q. Will I have to deliver the boots to you myself? No. Centre Spot will be organising regular donation dates throughout the football season where our staff will be on hand to collect the boots from you. Q. Do you take boots in any condition? We will gratefully accept boots in any condition; however they must come as a pair! Q. Do we need to do anything to the boots before you take them? It would be very helpful if you could tie the bootlaces together, and slip a small piece of paper inside one of the boots with the size written on it. We can do this ourselves, but occasionally the sizes have worn away, making the boot sizes impossible to identify. Q. We have a large number of pairs of boots at our club. Do we need to wait for a collection date? (see the Contact Us page of the Centre Spot website) and we will arrange a time at your convenience to collect the boots from you. Q. How can I get Boots from Shoot 4 Boots? You will be able to get boots by following the link on our website www.centrespot.org. Anyone requiring boots will be required to pay for postage and packaging. 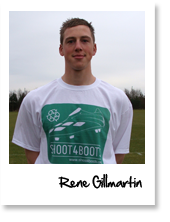 We will also be organising Shoot 4 Boots coaching days. Please keep checking our website for details. Q. I live outside the United Kingdom, can I get boots from Shoot 4 Boots? Unfortunately we are currently unable to send boots outside the United Kingdom, we do however intend to start sending boots to developing countries, particularly in Africa, and Asia. Please keep visiting our website for further details. 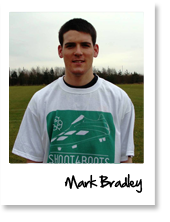 Mark Bradley- Professional Footballer, Rotherham FC. 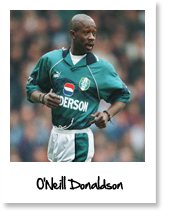 O’Neill Donaldson – Former Professional Footballer. Centre Spot would like to thank you for your support in this initiative!